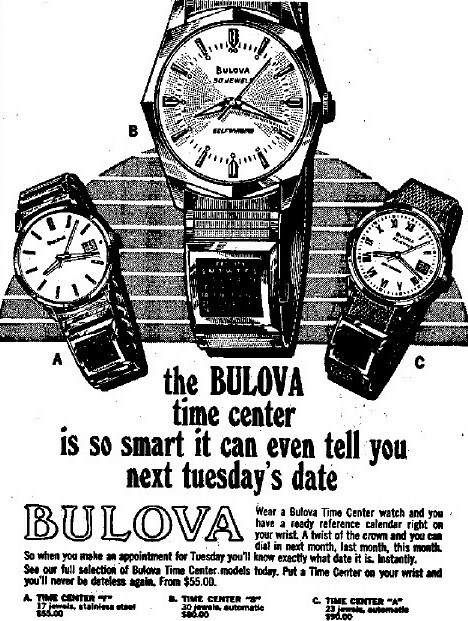 Bulova 1968 Time Center "A"
Unsure of what exactly this one is as it's marked Bulova, 23 Jewels, self winding. The movement, the 10cpacd, has very little written online about it other than a mention that it was one of few American made movements with a complication (date). 10kt gold filled case, inside caseback case style stamp = 2525. Subject watch has 23 Jewels. Looking deeper into another model/variant....perhaps. 17J version is a Date King "NP" & "NO"
30J version is a Date King "VW"
There is a 23J Date King "AF" with a different dial, but this at least shows that the Date Kings were infact released with either 17,23 or 30 Jewelled movements. Any takers for the Time Center "A"? The complication date movement fits in with the unique date function descriptionin the ad. I believe the unique Calendar strap makes the model the 'TIME CENTER' ? You're dead right Mark, I forgot that was the functional feature in this watch. For a moment there I was thinking that it had to do with a special feature of the movement, but it's actually the rotating calendar scroll on the watch band. Is that what I'm reading under the C.? That's certainly what I read. So whilst the movement points to it being a Time Center, is it still that when the key feature is missing, the calendar scroll? If anyone has the catalog that uses the inside case style stamp to discern other parts #'s, I would greatly appreciate any info you can get from my case # 2525. The movement is a little loose in the case. I need a caseback gasket, and I'll need to check if it's missing/needing a movement retainer ring (for lack of the proper term).